The Content Security Policy (CSP) HTTP response header declares which dynamic resources are allowed to load in the browser. These values have the following meanings, as documented here: https://content-security-policy.com/. 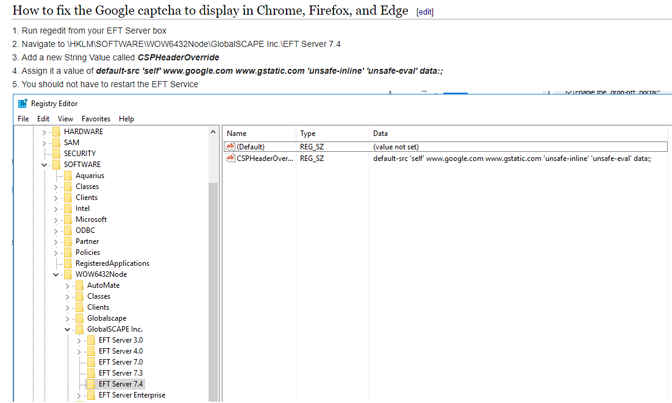 You do not need to restart the EFT server service for the new CSP to take effect. If you enable Google reCAPTCHA for the Drop-off portal, you will need to modify the allowed CSP domains to also include google.com and gstatic.com. This is necessary so that Google’s reCAPTCHA service will work.